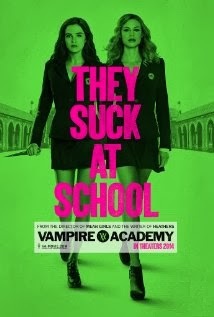 Plot Summary: Based on author Richelle Mead's worldwide bestselling series, "Vampire Academy" tells the legend of Rose Hathaway (Zoey Deutch) and Lissa Dragomir (Lucy Fry), two 17-year-old girls who attend a hidden boarding school for Moroi (mortal, peaceful Vampires) and Dhampirs (half-vampire/half-human guardians). Rose, a rebellious Guardian-in-training and her best friend, Lissa - a royal vampire Princess - have been on the run when they are captured and returned to St.Vladamirs Academy, the very place where they believe their lives may be in most jeopardy. Thrust back into the perils of Moroi Society and high school, Lissa struggles to reclaim her status while Rose trains with her mentor and love-interest, Dimitri (Danila Kozlovsky), to guarantee her place as Lissa's guardian. Rose will sacrifice everything to protect Lissa from those who intend to exploit her from within the Academy walls and the Strigoi (immortal, evil vampires) who hunt her kind from outside its sanctuary. Thanx for sharing the movie this is really nice movie !